If you want a recipe for a delicious Rainbow Cake, and to learn EXACTLY how to make it, you came to the right place! You’ll love this cake if you’re a big kid at heart (and real kids love it too of course!). Thousands of people have made awesome Rainbow Cake’s using this recipe (see the comments and gallery of their awesome cakes!). Even complete beginners to baking have told me they’ve made this cake successfully (as well as 7 and 8 year old kids!). Rainbow Cake is THE perfect cake for any celebration. Fun, pretty, delicious and AWESOME, Rainbow Cake never fails to make everyone smile! Let me tell you right now – this cake is DELICIOUS! The concentrated gel colours have no effect on the flavour – a yummy vanilla cake sandwiched together with gorgeous thick cream cheese frosting! Soooo good! If you have any questions not covered in this post, see my Rainbow Cake FAQs post, and if you need help, leave me a comment or tweet me @kerrycooksblog and I’ll help as soon as I can. There are not enough exclamation marks in the world to convey the JOY that this cake will bring you! I first came across this awesome version over at sweetest blog ever Sweetapolita. I also came across this great version by Whisk Kid. Unsurprisingly, before I made this cake, I was SUPER intimidated by the idea of making a rainbow cake. All the recipes I found used Swiss meringue frosting and supermarket cake mixes, so I decided to make an easy UK version using only everyday ingredients. It’s based on a victoria sponge recipe (with the quantities doubled) and topped with cream cheese frosting. It works a treat! And it tastes delicious too. Essential tips about making this cake that will make YOUR life so much easier. Don’t skip this section! 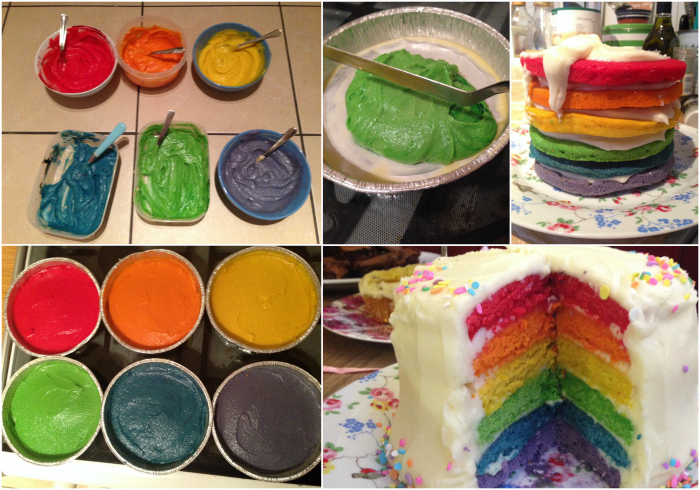 SO IMPORTANT: To make a really bright and vivid rainbow cake, you need concentrated food colours. They’re called gel or paste colours and you can order them online. I get mine from eBay – they even sell kits of all the colours you’ll need for this cake, for £10-£12. It may seem a lot, but the gel colours last for years, and you’ll have enough to make many rainbow cakes, or Rainbow Cupcakes, or Rainbow anything! If you have a cake decorating shop near you, try there as they will definitely sell them also, as do Lakeland. There’s no getting around the tip above – many readers have told me they’ve tried liquid food colouring (your rainbow cake will be a huge disaster) and some of the gel colourings available in supermarkets (in the UK at least, such as the Dr Oetker range of gel colours – also very poor results) – if you want an AWESOME rainbow cake, you need to use the recommended colourings. Don’t have six same sized cake pans? You don’t need them! I use disposable tin foil ‘flan cases’ that I found in Wilko (I used these ones, which are 6 inches). Supermarkets also increasingly sell disposable cake cases, in loaf and other shapes. But don’t worry if you can’t find anything like this, you can just use regular cake tins – depending on how many you own, you’ll need to cook the cakes in stages (if you own three, two stages isn’t too much hassle, if you only own two cake tins I would consider buying/borrowing another one). Another plus of using tin foil tins is that you can cut down the sides and get the cake out easily if it gets stuck, plus there’s no washing up! This recipe makes a 6 to 8 inch Rainbow Cake, depending on the pans you use. With 6 inch pans, your cakes will be thicker giving you a VERY tall cake. With 8 inch, they’ll be thinner (around 1cm for each layer, giving a more regular sized, though still tall, cake). If you’d prefer your rainbow cake to have thinner layers and be less skyscraper like, simply use 8 inch can tins rather than 6 inch. You absolutely CAN make, bake and decorate a Rainbow Cake all in one evening, BUT you will make it so much easier on yourself if you follow this timeline and make it over a couple of days. After all, last minute stress is the last thing you want before a birthday party or big occasion! Baking the cakes then freezing them straight away also means that the cake stays super fresh and it’s so much easier to frost too. Thursday evening: Bake your cakes! It takes me about 60 minutes to mix, colour and bake all the layers. Let them cool, then remove each cake from the tin and wrap in foil, then pop into the freezer. Friday evening: Remove the cakes from the freezer and put them into the fridge to defrost overnight. Make the cream cheese frosting and put into the fridge overnight. Saturday morning: Frost your cake – it will be much easier once it’s been frozen, even for a little while! If you have any questions, see my Rainbow Cake FAQs post, and if you need help, leave me a comment or tweet me @kerrycooksblog and I’ll help asap! A gorgeous 6 layer rainbow cake topped with cream cheese frosting! Use a stand mixer if you have one, but if not, don't worry - just get out your biggest bowl and a spatula! Cream your butter and sugar until combined and light and fluffy - a couple of minutes of beating on high speed in a stand mixer. Then, add eggs one at a time followed by a little of the flour and mix well (with the mixer now on slow) before adding remaining flour, baking powder and vanilla extract. If your mix is a little thick as mine was, add up to 40ml of - adding a tablespoon at a time and stopping when you get to a consistency that you're happy with. Next, divide your mix into 6 bowls (including your original bowl) to do your colours. I divided my mix by eye, not bothering to weigh my mixture and divide it exactly equally (hey, I'm not on the bake off!). Drizzle on some of your red gel colour and mix in. Using a silicone spatula works well here. Keep adding and mixing a little until you have the vibrant shade you want. Its actually very hard to go overboard with gel colours, but don't add too much at once or you may get a darker and less vibrant colour than you wanted. I usually add around a teaspoon of each colour. Ten minutes and an aching arm later, you'll have a beautiful rainbow of cake batters! Use a spatula to scoop all of your batter into a disposable tin (per colour of course - don't mix them up unless you want a tie dye rainbow cake!). Use the back of a spoon to smooth down each cake - this will help them to bake flat. Pop them into the oven and keep a close eye on them - you don't want them to get browned. I really recommend rotating your cakes so that none of them are on the top shelf of the oven for too long - you don't want domed cakes ideally. I rotated my cakes on the oven shelves throughout the cooking time (mine took around 20 minutes total), taking them out as soon as a skewer to the centre came out clean. Follow my foolproof method for thick cream cheese frosting. Put a little of the cream cheese frosting on the plate or cake stand you'll be using to adhere the first layer of cake. Pop it onto the centre of the plate, and then frost and put on the next layer. Careful not to use too much frosting, as the weight of the cake will push it out the sides of the cake- just a thinnish layer is best. After the first three layers, put the cake into the fridge for thirty minutes to chill. Apply a crumb coat of frosting to the cake, filling any gaps between layers. The colours of the cake will be very apparent, but don't worry. Chill for 1 hour. How much will your Rainbow Cake cost to make? At least £20, plus your time! You’ll need to buy a set of vibrant gel colours, if you don’t already have them, for about £12. The disposable tin foil cases I recommend currently cost £1, and you can expect the rest of your ingredients to be £7 – £10 depending on where you shop. How many people does this Rainbow Cake serve? double or even triple this Rainbow Cake recipe (unfortunately unless you have access to an industrial kitchen, you’ll still need to make them in several batches) and make a square or rectangular Rainbow Cake, like this one. You can easily get disposable tin foil roasting trays that would be a good size for this – they certainly sell them in supermarkets and shops like Home Bargains. make other rainbow themed food, like fruit skewers – I have lots of Rainbow party food inspiration on this Pinterest board! How can I scale up this Rainbow Cake recipe? Easily! This recipe divides by 6 (since it gives 6 layers) so it’s easy to scale it up OR down. To make a three layer rainbow cake: We’ll cut the recipe in half! You might want to make a halloween, or a Christmas coloured one, or anything you like. Use 175g each of butter, sugar and flour and 1.5tsp of baking powder. To make a 6 inch rainbow cake: Use the recipe as given above, it will give you a perfect Rainbow Cake but with thicker layers than the 8 inch version. To make an 8 inch rainbow cake: Use the recipe as given above, it will give you a perfect Rainbow Cake but with thinner layers than the 6 inch version. To make a 10 inch rainbow cake: You’ll need to use 465g of butter, sugar and flour, and increase the baking powder by half a teaspoon. To make an 8 layer rainbow cake: So you want your rainbow to include pink and turquoise? Awesome! You’ll need to use 465g of butter, sugar and flour, and increase the baking powder by half a teaspoon. 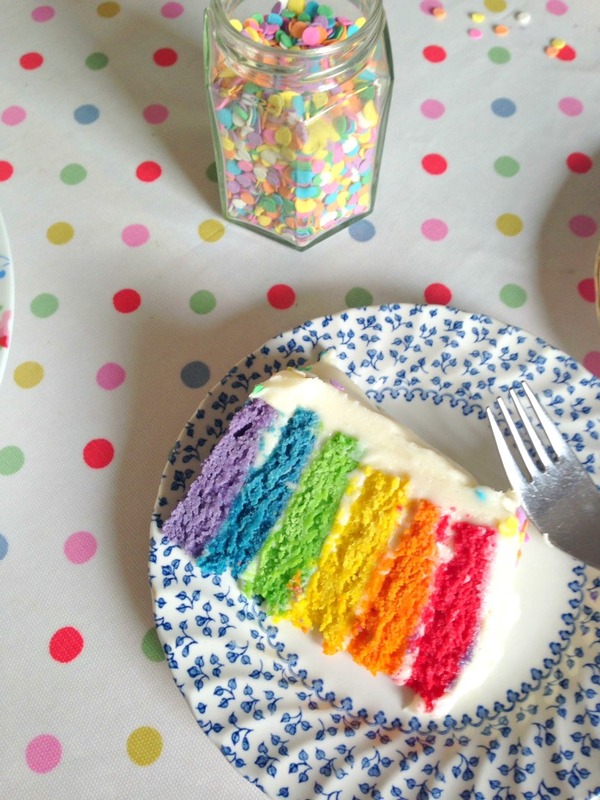 Want to make a gluten-free Rainbow Cake? Just replace the plain flour with gluten-free flour, such as Dove’s gluten-free flour (or similar). Where can I get bright Rainbow sprinkles from? Again, ebay! Or a local cake decorating shop will probably have some good ones. I’ve also occasionally found great ones in shops like TK Maxx/Homesense, Home Bargains, and supermarkets – but it’s very unreliable, and supermarkets tend to sell the worst, dullest ones. Can I make a Rainbow Cake with natural food colourings? You can….. BUT it won’t be nearly as vivid as one made with vibrant gel food colouring. It’ll probably look a bit like this. Want to cover your Rainbow Cake with fondant? Simply cover the Rainbow Cake with Cream Cheese Frosting as the recipe, leave it to chill until firm, and then add the fondant. The Rainbow Cake is sturdy and will hold up to the weight of the fondant, plus decorations on top, without any dowels (the freezing part of the process especially helps with that so don’t skip it if you want to put lots of fondant on your cake). This cake would be super duper awesome for a kids birthday party…. especially if you kept the rainbow part a secret… can you imagine? Rainbow cake makes me so happy. Oh and did I mention that rainbow cake is just the beginning? Check out these amazing ombre cakes which use exactly the same method. And my amazing Rainbow Cupcakes, which are an even easier version of this cake! Please share your Rainbow Cakes with me – tag me on Facebook, Twitter or Instagram so I can see and share! If you’d like to send me a picture of your cake, email me one at kerrycooks.com@gmail.com! Great recipe and advice! Thank you for sharing. We made this cake for my mums birthday and it was so fantastic and so easy. Thanks so so much. Made this cake a couple of times now. I am so happy with this recipE! It’s easy and fun to Prepare this cake and it tastes so delicious and fluffy! I tried other recipes , but the cake Was too heavy. This one is Light, viBrant colours and good taste. Best recipe so far with good instructions! Thankyou. Sorry Kristi, you’ve probably made the cake by now but NEVER use liquid colouring – it will be a disaster. Hope you didn’t already learn that the hard way! I WANT TO make this cake for this weekend for my daughter. it will be a unicorn cake on the outside but rainbow on the inside. i want the cake completed by friday night, so if i bake thursday day, should i freeze after baking and then put in the fridge fri morning ready to frost fri eve? if i use 8″ tins does ANYONE know how tall it will be roughly? I’m not sure whether to make it an 8 layer so its tall enough! 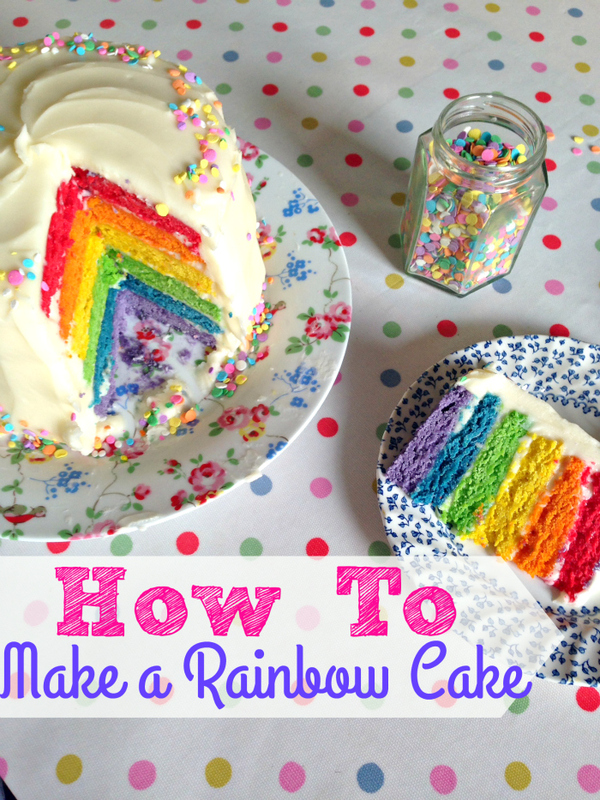 Hey Buddy!, I found this information for you: "Easy 6-Layer Rainbow Cake – Step by Step". Here is the website link: https://kerrycooks.com/easy-6-layer-rainbow-cake-step-by-step/. Thank you.